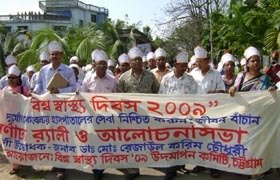 YPSA and Chittagong Health Coordination Committee organized colorful Rally and discussion meeting on 7 April. Health Coordination Committee, Chittagong together with GO, NGOs and other health stakeholders has been jointly observing ‘World Health Day’ since 2001 in Chittagong Division with the secretarial support of YPSA . Dr.Rezaul Karim Chowdhury Chittagong, Divisional Director (Health) inaugurated the rally and join as chief guest in the discussion meeting at Civil Surgeon Office. Representative of WHO , Deputy Director of Family Planning, Sr. Health Education Officer, Civil Surgeon Office, Professor Dr. A.Q.M Serajul Islam. Ms. Khaleda Begum, Team leader of YPSA GFATM912 and Ms. Lutfun Nahar, Program Manager of YPSA spoke in the meeting.